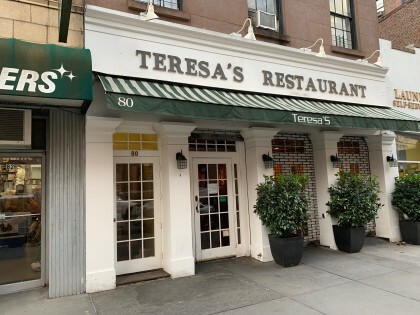 The Brooklyn Paper reports that popular neighborhood eatery Teresa’s was closed Tuesday by order of the Health Department because of “evidence of mice inside, and … that the kitchen’s setup did not adequately protect food from contamination.” However, this afternoon the yellow Health Department sign was gone, and in its place was a hand-lettered sign saying the restaurant was “closed for maintenance” and would re-open tomorrow (Friday) morning. It’s mind blowing that these places can’t keep it sanitary. I also noticed a giant sticker from the health department slapped on the door of The Thai Retaurant Pinto. Gallitos had so many problems with a C rating and it seems like their doors have been closed for a few days now. Keep it clean, keep up the extermination it’s not that hard. Have you seen the yard behind Pinto? It’s a literal rats nest! It’s impossible to keep out rats when there’s garbage strewn about outside of a building. The apartment two down from Teresa’s has started leaving its garbage outside under the scaffolding. I bet the rats love that. Have you noticed all the little spaces on sidewalks all over BH where there are obviously rats living underneath? The owners of the buildings need to fill these in. What’s up with Gallito’s. Sign says, Under New Management. I’m always surprised I don’t see more rats on the commercial streets around the Heights – like Remsen between Court & Clinton. An absolute pigpen, especially on the north side towards Court. I guess the constant pedestrian traffic scares away all but the most intrepid rats. Having been in the restaurant business, I can attest, vermin can sometimes pop up despite ons best efforts to keep them out. Particularly in older buildings it can be a constant battle, never to be won. Teresas has consistently had a good rating from the DOH, so I’d consider this an anomaly. My wife and I have been fond of Gallito’s for several years. We went there last week, saw the “Under New Management” sign, and were undeterred. After we placed our orders, we were given the customary chips and salsa, but the chips were oily and not crisp. We mentioned this to the waiter, who said, “We just made them.” Our entrees seemed smaller than usual. I had asked for a side dish of jalapenos, which under the old management would be a simple small dish of sliced peppers, often provided gratis. What I got was a small salad with some sliced jalapenos in it, and was charged accordingly. Fortunately, Grand Canyon has a promising looking Mexican menu. Now if only they would get their beer/wine license. It’s unlikely that the restaurant would make it’s own tortilla chips. If it did, however, there’s the problem of draining them thoroughly to prevent greasiness and keeping them crisp, if not served immediately. Takes more commitment, let’s call it, than I’d ascribe to the place,. Actually, it is very common for restaurants to make their own tortilla chips. It’s cheaper, fresher and takes up much less room to store them. Stacks of corn tortillas are pie-cut, deep-fried and drained. If done right they shouldn’t be greasy. DOH (another government agency) seems to agree with me on this one. That’s my point, Teresa’s maintained an “A” ratting from the DOH, most of the time. One time evidence of a mouse is inconsistent with their history. “Evidence of mice or live mice present in facility’s food and/or non-food areas” is going back to at least 2017, and the place was already shut down before in 05/2018 for some 40 violations, many “Critical”. Are you shill for Theresa’s by any chance? I used to work at a Chi Chi’s. They fried their own chips. It’s pretty simple. I’ve enjoyed Teresas over the years. Its been the breakfast/brunch meeting place for countless occasions w/ my inlaws. I always loved the fact they actually served fresh squeezed OJ. I hate it when places say it is fresh squeezed and then serve concentrate. The service has never been the greatest but the food is generally really good. Anyway, I stopped going there a couple months ago. Last time there, we had a rather tall and unfriendly waitress who was unpleasant throughout the meal (kind of rude, got orders wrong). One of the incorrect orders was mine and when I very nicely asked her to just have them melt the cheese that I had ordered on top on my omelette, she took the plate without comment and brought it back a couple minutes later. I took two bites and then on the third I felt like I bit into a rock. I’m now 5 visits into a replacement for a cracked tooth. I never said anything that day unfortunately, as I should have. I just wanted to get out of there and I didnt know I had damaged it to that extent. But I have a real suspicion that she blamed the mistake on me when she went back to the kitchen and something found its way into my food. I obviously cant prove it, but its just a little too coincidental. I am also not a troll, just someone who had a really bad experience there and never said anything about it until now. This story is the icing on the cake for me. Too bad. I was a fan when you played on the Nets in the 1980s Otis. I hope your comment does not get removed. Mine was since it was negative, although honest.